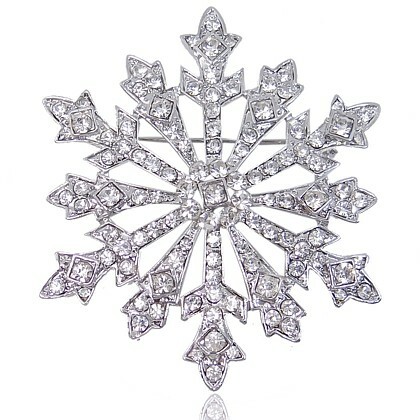 The perfect size and design to give any lapel or pocket a spectacular dash of sheer unadulterated glamour! The style has an ornate heraldic look that is impressive and very sophisticated. Will be seen as a Snowflake in the Winter months and a shimmering geometric shape throughout the rest of the year, making it a universal shape that also lends itself to hats, bags, gloves and so on. Size: 4.5cm (1¾") x 5.3cm (2"). Silver rhodium setting that will not tarnish.